Fifteen years ago today, seven American women walked into the Georgia Dome in Atlanta, Ga., for the women’s team finals at the 1996 Centennial Olympic Games. The women, greeted by the thunderous applause of the partisan crowd of more than 32,000 fans, went on to win the first-ever Olympic team gold medal in women’s gymnastics for Team USA. The team, dubbed the ‘Magnificent Seven,’ was a mix of Olympic veterans, seasoned competitors and newcomers, made up of team captain Amanda Borden, Amy Chow, Dominique Dawes, Shannon Miller, Dominique Moceanu, Jaycie Phelps and Kerri Strug. It was the perfect storm of history and sports drama. Amid uncertainty at the top of the standings, Strug landed the last vault of the competition on one leg, ensuring the Americans the gold medal and a special place in gymnastics history. Here’s a quick look at what each of these incredible women are doing today. 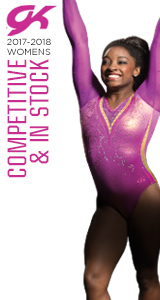 Borden, who narrowly missed the 1992 Olympics, now owns and operates Gold Medal Gymnastics Academy in Arizona with her husband, Brad Cochran. She and Cochran have two children, Kennedy and Brody. Borden, who earned her bachelor’s degree in early childhood education from Arizona State University in 2003, also works as a gymnastics and cheerleading commentator offering her expert analysis for events including tonight’s 2011 CoverGirl Classic on Universal Sports. For Chow, it seems as if there is nothing she hasn’t done since winning Olympic gold in Atlanta. The California-native, who was also part of the bronze medal-winning team at the 2000 Sydney Olympics, is now a pediatrician at Palo Alto Medical Foundation’s Dublin Center. Chow, who graduated from Stanford University School of Medicine in 2007, married Jason Ho, an orthopedic surgeon, in July 2010. The Olympic uneven bars silver medalist also took up pole-vaulting, recording 13 feet, 5 inches personal best, and recently missed competing for a berth to the 2011 AT&T National Championships in diving with an injury. Like Chow, Dawes was a member of Team USA at the 2000 Olympics, her third appearance at the Games, and has participated in a wide range of activities since the Atlanta Games. Dawes, a 2002 graduate of the University of Maryland, even appeared on Broadway in the musical ‘Grease.’ She resides in Maryland and works as a co-host for Yahoo! News’ Weekend Edition in addition to her work with Super Bowl champion Drew Brees as part of President Barack Obama’s President’s Council on Fitness, Sports and Nutrition. America’s most decorated gymnast, Miller, the 1996 Olympic balance beam champion, graduated from Boston College with law degree in 2007 before starting the Shannon Miller Lifestyle website where she promotes women’s health education. She married John Falconetti in 2008 and gave birth to their first child, Rocco, in 2009. Recently, Miller overcame the greatest adversity of her life – ovarian cancer, receiving a clean bill of health in May 2011 (read Miller’s inspiring story here). The youngest member of the Magnificent Seven, just 14 during the competition in Atlanta, Moceanu now lives in Cleveland, Ohio, with husband Dr. Mike Canales and their two children, Carmen and Vincent. Moceanu and Canales acted as the official spokespeople and in-arena emcees of the 2011 NCAA Women’s Gymnastics Championships in Cleveland, pumping up the crowd before the Super Six team finals with cheers from each of the competing schools. Moceanu, a motivational speaker, fitness advocate and 2009 graduate of John Carroll University, recently announced the launch of a four-part gymnastics-themed fiction book series to be available in April 2012. After coaching current NCAA standouts Michigan’s Brittnee Martinez and Penn State’s Sharaya Musser at Colorado Aerials in Colorado Springs, Phelps moved back to her hometown of Greenfield, Ind., to open the Jaycie Phelps Athletic Center with Dave Marus and her parents, Jack and Cheryl. The multi-sport facility, where Phelps works as a coach, currently features gymnastics, cheerleading, baseball, softball and soccer. Two-time Olympian Strug, who holds a master’s degree in sociology from Stanford University, now lives in Washington, D.C., working in the Office of Juvenile Justice and Delinquency Prevention at the Department of Justice. There, Strug reviews organizations receiving federal funds to ensure that tax dollars are spent appropriately in order to make a difference in the lives of high-risk children around the country. She married Robert Fischer, an attorney, in April 2010.